London: British Prime Minister Theresa May had said that the country's threat level from terrorism had been reduced from its top level of "critical," which indicates an attack is imminent. May says it now stands at "severe," meaning an attack is highly likely. The level was raised to critical after Monday's bomb attack. May said that major progress has been made in the investigation but that people should remain vigilant.Police are searching a number of properties and have 11 suspects in custody in connection with Monday's explosion at an Ariana Grande concert in Manchester, which killed 22 people and injured dozens. More than a thousand armed police are on standby as major events including the Football Association Cup Final and the Premiership Rugby Final are expected to draw tens of thousands of people. Despite the country being placed on critical alert, police have urged people to go out and enjoy themselves. 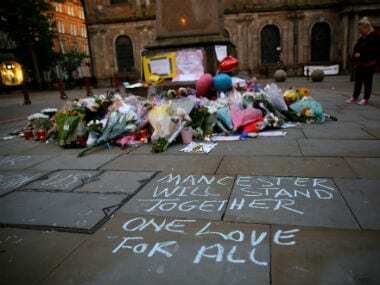 British police investigating the lethal concert bombing in Manchester have said that they have made two more arrests. Police said that two men, aged 20 and 22, were detained early Saturday on suspicion of terror offenses. Police used an explosive device to get into a property to make the arrests.